Family bungalow for 4 people with 2 separate bedrooms connected with a living area and bathrooms in its own, located in the front row with panoramic sea view and private balconies right next to the ocean. Ideal for 2 people with a private balcony in front to relax your day, located in the middle row only few metres to the beach. 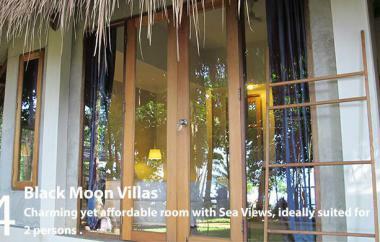 Open widely for a morning sun and seabreeze right off from your bed. Charming yet affordable bungalow for 2 people with the same facilities as other rooms, located in the back row but still facing out to the sea. A compact size house suitable for every traveller. Copyright © 2015 Little Moon Villa Koh Mak, Trat, Thailand All Rights Reserved.